by Tom Carroll, CS Unitec. Portable drilling in applications such as construction, steel fabrication and more poses many challenges – the method of hole creation is just one of them. Understanding the difference between twist drilling and annular cutting, and the equipment, power and time required, will have you efficiently and expertly cutting holes in steel, stainless steel and other metals. Twist drilling, the creation of holes in metal with a drill bit, is probably the most recognized method of hole making. 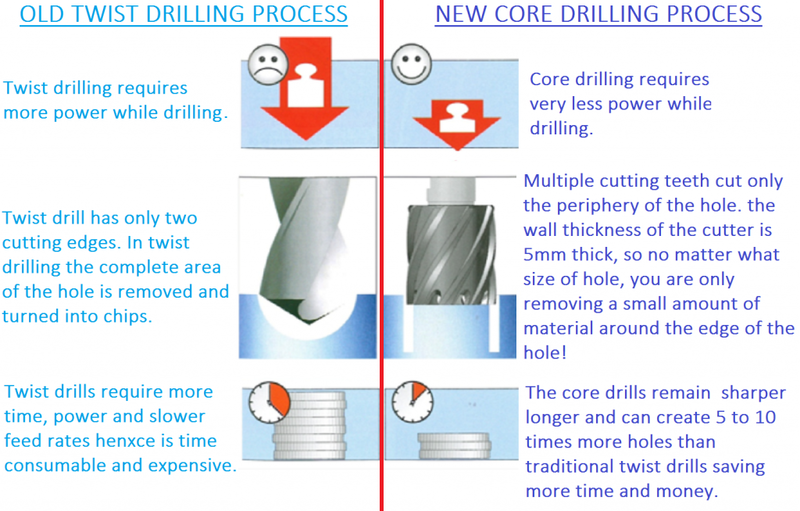 But, with only two cutting edges, twist drills require more time, power and slower feed rates because the complete area of the hole is removed and turned into chips. Annular cutting, the cutting of metal with a hollow-core bit, is an efficient way to create holes 7/16″ to 5″ diameter (up to 3″ deep) with an accuracy of +0.004″, -0.000″ in steel, stainless steel, etc. Multiple cutting teeth cut only the material around the periphery of the hole, forming a solid metal slug. In fact, the wall thickness of the cutter is approximately 1/4″ thick, meaning that no matter what size hole you are cutting, you are only removing a small amount of material around the edge of the hole. Because the cutting surface of annular cutters is spread out over multiple cutting edges (teeth), they remain sharper longer and can create 5 to 10 times more holes than traditional twist drills. Final holes are smooth and burr-free – no reaming is required. Additionally, hole cutting with annular cutters requires no predrilling or stepdrilling. Annular cutters are commonly used to do on-site repair and to make mechanical openings and pipe thru holes. 1. The pilot pin accurately centers the cutter over the area to be drilled. 2. During drilling, the pilot pin retracts and allows the internal lubrication to reach the cutting teeth. 3. When the hole is complete, the slug is automatically ejected from the cutter, leaving an accurate, finished hole. Another unique feature of annular cutters is their tapered inner wall. On high-quality precision-engineered cutters, the tapered wall design serves two functions. Primarily, it accommodates for the effect of frictional heat, which causes the expansion of both the cutter and the internal metal slug (coupon). Secondly, it facilitates the smooth, easy ejection of the slug. When preparing to drill holes on-site or in the shop, it is important to consider the method of drilling as well as the equipment, power and time required to complete the project. These factors will help you determine the best method to complete your hole-making project. Both annular cutting and twist drilling require a drill press or machine to turn the cutting tool. Due to the physical design of the drill bit, twist drilling requires a machine with more horsepower – most often a bulky, bench-mounted machine that is traditionally vertically configured and less portable. To explain, the speed of the twist drill, at its center, is zero. A large amount of force is needed to “push” the material from directly under the tip of the bit outward, where the two cutting edges can bite and convert the solid material into chips. The larger the hole, the more time and horsepower are required to evacuate the material. Alternatively, annular cutters can cut at higher feed rates with lower horsepower consumption, meaning they can run on smaller machines and drill 3x to 4x faster. For instance, holes that used to be made with conventional twist drills on heavy, bulky, 70-80 lb. machines can now be made on smaller, lighter (approximately 24 lb.) portable machines. A wide variety of portable magneticmounted drills exist to drill holes, on-site, for repair or construction on structural steel. These newer, lightweight machines can also be used in manufacturing or fabrication shops. Configurable in both horizontal and vertical positions, magnetic drills are also available with pneumatic or hydraulic power for underwater/hazardous locations. Twist drilling, generally, is ideal only for holes up to 1/2” diameter. Holes over 1/2” are best handled by annular cutters. Twist drills are available in more precise diameters – annular cutters increase by 1/16”, whereas twist drills are available in increments of 1/32”. Twist drills are ideal for blind holes in applications where the hole does not need to go completely through the material. Additionally, they are good candidates for creating starter holes when tapping, as twist drills are available in more exact fractional sizes. Less chatter and drift is experienced when annular cutting thru holes, leaving a more symmetrical and accurate hole. Applications involving overlapping holes are also more easily managed with annular cutters. In addition to the aforementioned drilling capabilities afforded by portable drills and annular cutters, another consideration is hole location and finish. Annular cutters drill holes that are otherwise difficult or impossible with twist drills – there is no predrilling or step drilling required. Annular cutters are also ideal candidates for applications where a finished, burr-free hole is needed. This includes drilling pipe or tubing where special tools or manual scraping are not feasible or possible in the middle of a difficult-to-access cylinder. Unless you’re making blind holes or holes less than ½” diameter, annular cutting is worthy of serious consideration, especially if your application is not under controlled shop conditions. TiAlN-coated annular cutters are available for applications where the use of lubrication or coolant is not practical – i.e. horizontal drilling or where material or environmental contamination is a concern. One final benefit of annular cutting is evident after the job is complete – cleanup and recycling. When twist drilling, many sharp chips are intermingled with the lubricant. Separating the two for environmental and recycling purposes is difficult, time consuming and costly. 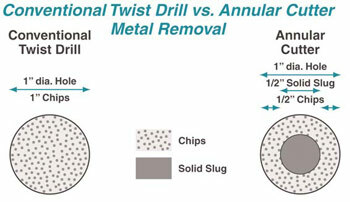 Scrap from annular cutters consists of a minimal amount of swarf and a solid slug. Separating a solid chunk of metal is easier, plus it will generate more profit when selling back the scrap. Previous Previous post: What is a Magnetic Drilling Machine?